SPORT IS IT OVER FOR COUTINHO IN BARCELONA? IS IT OVER FOR COUTINHO IN BARCELONA? 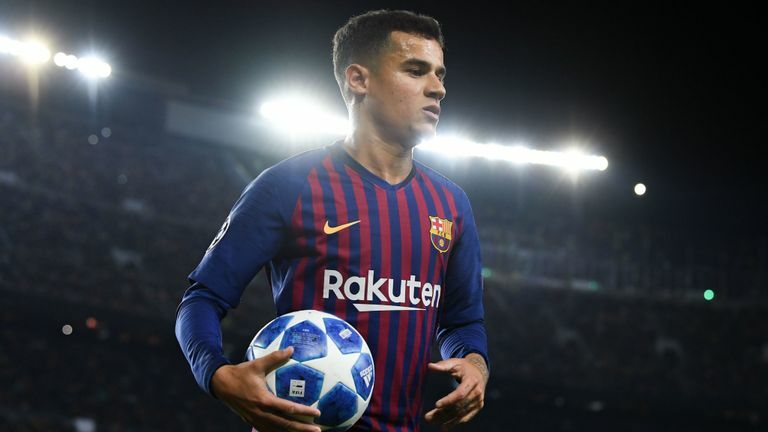 With Ousmane Dembele sidelined by injury, Barcelona's trip to Real Betis on Sunday was viewed as an opportunity for Philippe Coutinho to impress. The Brazilian has struggled to hold down a place in Ernesto Valverde's team lately, but Dembele's torn hamstring - confirmed after last week's Champions League win over Lyon - was supposed to reopen the door. Unfortunately for him, it did not work out that way. While Lionel Messi lit up the Benito Villamarin stadium with his stunning hat-trick, Coutinho was a mere spectator, watching on from the bench until he replaced Luis Suarez in the 89th minute. There were tactical factors at play, of course, but Coutinho's omission still felt typical of his season so far. It has not been easy. Coutinho started promisingly in Catalonia following his £146m move from Liverpool last January, but his form has deteriorated in recent months. Coutinho has not scored a La Liga goal since October. His last 16 appearances in the competition have yielded a solitary assist. There were signs of improvement in the Champions League win over Lyon, when he scored Barcelona's second goal, but Coutinho is not the key figure he should be. He did not make Valverde's team for either of their recent meetings with Real Madrid. He was even jeered by Barcelona fans during the subsequent 3-1 win over Rayo Vallecano. Coutinho is aware of the criticism. "It's true that in the last few games, weeks - maybe months - I have not played so well, but I have never stopped wanting to improve and learn and that's how I'll always continue," he said last week. But will it be enough to turn things around? The biggest challenge he faces is to rebuild his confidence. Coutinho relished his senior status at Liverpool, frequently stepping up and making the difference when it mattered most, but the level of expectation is far higher at Barcelona and it seems to be weighing him down. The issue has not gone unnoticed by Valverde, who has referenced his confidence on numerous occasions in his media appearances, or by his team-mates. During Barcelona's Copa del Rey meeting with Sevilla at the end of January, Messi even handed over penalty-taking duties to the 26-year-old in order to give him a boost. Coutinho converted that penalty, but his performances have continued in much the same vein. The Brazilian is at his best when acting on impulse, but with diminished confidence and self-belief, his trademark spontaneity has given way to inhibition and his effectiveness has suffered. The statistics prove it. Coutinho is making fewer dribbles per 90 minutes than in any of the last five seasons and it is the same story with shots and chances created. He scored 20 goals and provided 13 assists in league and Champions League games last season, but those numbers have fallen to six and five respectively in the current campaign. Coutinho has not been helped by a lack of positional stability. Barcelona's former sporting director Robert Fernandez described him as "the ideal replacement" for Andres Iniesta last season and it seemed symbolic when he scored the only goal in the Spaniard's farewell appearance against Real Sociedad in May, but it seems Valverde no longer sees his future there. Indeed, the Barcelona boss has not used him in central midfield since the early weeks of the season, with Arturo Vidal and Arthur moving ahead of him in a midfield pecking order which is headed up by Sergio Busquets and Ivan Rakitic. It leaves Coutinho to fight it out for the final spot in the front three alongside Lionel Messi and Luis Suarez. When fit, however, Valverde has opted for the speed and directness of Dembele instead. The French international has had struggles of his own since joining Barcelona from Borussia Dortmund in the summer of 2017, but his importance to Valverde is such that he was even willing to use him as a substitute against Lyon last week despite concerns over his fitness. "I decided to risk him because it was such a decisive match," he said afterwards. The risk came at a cost, of course, with Dembele now facing up to a month out having aggravated his injury. The hope for Coutinho, though, is that it will work in his favour. His omission against Real Betis does not bode well, but Barcelona have a hectic schedule after the international break, with La Liga games against Espanyol, Villarreal and Atletico Madrid before the first leg of their Champions League quarter-final with Manchester United on April 10. Coutinho should get more opportunities in those games, but if his struggles continue it is not inconceivable that Barcelona will seek to cash in on him in the summer. Frenkie de Jong's arrival from Ajax will push him even further down the midfield pecking order, and reports in Spain suggest Barcelona also need to raise funds to bring in a long-term replacement for Luis Suarez. Coutinho has been coy on his future, saying "you never know what the future holds" in that interview after the Lyon game, but what's certain is that a player of his ability would command interest from elsewhere. Liverpool may have moved on, but Manchester United are in the market for creativity and have already been mentioned as potential suitors.